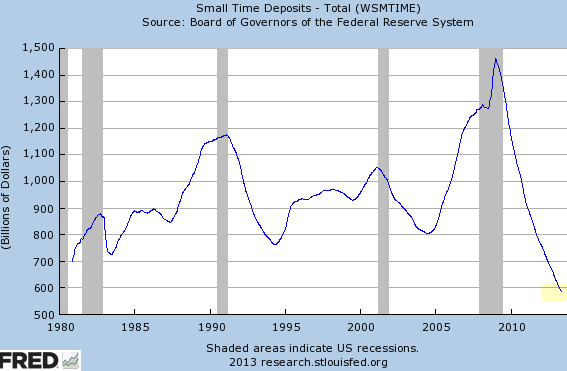 Retail savers in the US are abandoning certificates of deposits (CDs). The amount of CDs outstanding that are $100K or smaller has been on a sharp decline since the recession and is now at the lowest level since the Fed began keeping track of these balances. 1. Since the financial crisis banks have been less reliant on "wholesale financing", reducing incentives on term deposits (in some cases under the pressure from the FDIC). 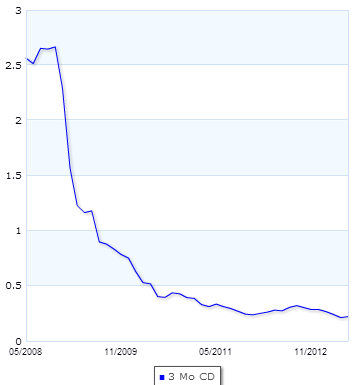 Indeed the rate on CDs has collapsed in 2009. The problem with this argument is that CDs still carry better yields than money market funds, most overnight accounts, or treasury bills. 2. After the financial crisis, people want to have access to their money immediately, while banks charge penalties for early withdrawals from CD accounts. This is certainly possible, but at the same time small investors are loading up on short-term bond funds and ETFs (see post). And those products can definitely fluctuate in value enough to cause the equivalent "penalty" from early liquidation. 3. People just don't have the cash to put into CDs. This explanation would make sense if it wasn't for the fact that savings account balances have been rising steadily since the recession. 4. Savers don't trust banks with money they can't immediately withdraw. Again, it's a strange argument given the fact that all of these CDs are FDIC insured. 5. Another explanation for this decline in CD balances is that in a number of instances, savings accounts may actually pay more. Some small banks, particularly credit unions, with limited retail presence want to attract customers by offering high savings rates. Non-traditional banks like Ally (GMAC), CIT, American Express Bank, USAA Bank, etc. are also in this game. According to GoBankingRates.com (see story) "short-term CDs often carry half or even less the interest you’ll find on an online savings account, even though savings are more liquid." The problem with such savings accounts is that these are often "teaser rates" and banks can and often do lower the rate suddenly vs. a CD that locks the rate for a period. Also in many instances (particularly with credit unions) individuals can't open these accounts online and have to show up on location in person. But it does seem that "high yielding" savings accounts have been the preferred choice of at least some savers as they walk away from lower yielding certificates of deposits. 6. Probably the most logical explanation is that for many people, getting 25bp in a 3-month CD vs. zero in a Chase overnight account, while massively better on a relative basis, isn't sufficiently different on an absolute basis (total dollars) to give up liquidity or warrant the paperwork of opening a CD account.